When I was young (back in the 80's) my parents owned a toy store. I remember my parents meeting me at the back door of the shop when I was walking home from school one day. They looked really excited. My mum explained that a shipment of new dolls had arrived... My Child Dolls. Her and dad had decided to line them all up in the back of the shop so that I could have first choice (for my upcoming birthday present), before the rest were put on the shelf. Once upon a time there was an old toymaker, that had so many sweet dolls, with big and tender eyes... he called all the dollies around itself. "There is out a very beautiful world outside - he told them - that attends for you a special mommy that will love you forever." "And as we will do to know who is?" -they asked the dolls. "But with your nose! -he responded - in fact the first that kiss you on the potato nose, it will be forever your sweet mom." Well, what a sight met my little eyes! There would have been over 20 boxed dolls stacked up high for me to choose from. I had really wanted a boy one, or one with dark skin, but sadly neither were among these. I ended up choosing a beautiful blonde doll with green eyes and her own little yellow teddy. Now I must confess... as I sat in the back of the store, no one in sight, the television statement ran through my mind again... "the first that kiss you on the potato nose, it will be forever your sweet mom." You can probably guess what I did... I went and kissed every one of those dolls on the nose. I remember feeling quite smug at school over the next year as each of my friends brought their own special My Child doll to school... only I knew the real truth! I ended up selling my doll last year on trademe... believe it or not for $100! They are actually quite rare now. 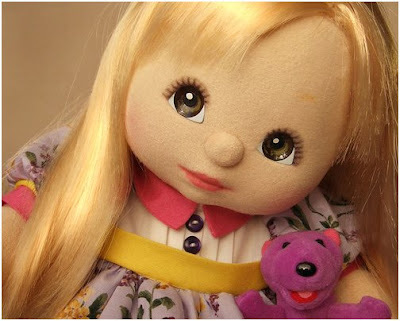 Does anyone else out there remember My Child dolls? I hope yours wasn't one I kissed! Very cute doll! Her eyes are the most beautiful I've ever seen. why oh why did you sell it? this one is so cute. I love my child but would of had to pay hundreds for one like yours. ohh! i had one or two of those!! i wonder if my parent's still have them in the attic?!?! i had forgotten how CUTE they are! Oooh yes! I have two My Childs, I was obssessed with them. No Cabbage Patch Kids for me only My Childs. I'm surprised they're rare now.